Driver's education is a course that teaches prospective drivers how to be safe and responsible on the road. If you're under 18 years old, the Connecticut Department of Motor Vehicles (DMV) requires the completion of a Driver's Ed course before you can apply for your CT driver's license. This page gives you information on what your CT driver's education course consists of, where to take the course, and what your next steps are. When do you take Connecticut Driver's Ed? Have your CT learner's permit. To apply for a learner's permit, you must be at least 16 years old and have permission from your parent or legal guardian. For information on how to apply for a CT learner's permit, visit our Drivers Permits in Connecticut page. Basic driver safety regarding motorcyclists, bicyclists, and pedestrians. Connecticut road signs and what they mean. The physiological and psychological consequences of alcohol and other drug abuse while driving. How Long is a Driver's Ed Course in Connecticut? You can take your Connecticut Driver's Ed course at a commercial driving school, at your high school, or at home. 40 hours of behind-the-wheel training. Can include driving time with your parent. Once completed, you can take your road test for your Connecticut driver's license 120 days after being issued your learner's permit. 22 hours of course study, PLUS 8 hours of the Safe Driving Practices course taken at a commercial driving school or high school. 40 hours of behind-the-wheel instruction. 2 hours of the parent training class. 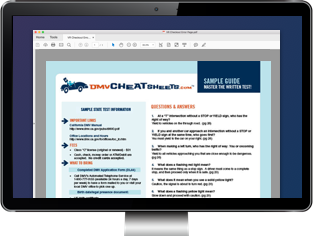 Once you have completed your home driver's training, you must wait 180 days after receiving your learner's permit before taking the DMV road test to get your Connecticut driver's license. If you want to pass the written exam on your first try, you should try an online practice test. These state-specific study helpers have been developed from content taken directly from the Connecticut driver handbook. It's like having the test before you take it! NOTE: Your parent or legal guardian is also required to complete 2 hours of parent training with you as part of your Connecticut Driver's Ed requirements. These hours are included in the classroom instruction component of your course. Contact the CT DMV for information on how to complete home training and what classroom materials you'll need to use. After Connecticut Driver's Ed – What's Next? Once you complete your Connecticut Driver's Ed course, you'll receive a Course Completion Certificate (Form CS-1). You'll need to bring this certificate with you when you take the road test. You must wait until you have held your learner's permit for at least 120 days or 180 days before you take your road test, depending on how you completed your CT Driver's Ed course. See “About Your Connecticut Driver's Ed Course" above. Once you pass the road test, you are eligible for your Connecticut driver's license. For information on how to apply, refer to our Applying for a New License (Teen Drivers) in Connecticut page.